A Gyr Falcon sits on a rocky outcrop in a steep ravine and gazes intensely over its surroundings. It is cloudy but now and again the sun breaks through the clouds and casts some light over the barren landscape. In a small cavity in the ravine, below the bird perched on the rocky outcrop, three chicks are resting after a good meal. They sit close together because although it is high summer, the wind is bitter so it is good to keep warm by sticking together. The murmur of the river, which flows lazily far below in the ravine, has a soporific effect. The Gyr Falcon ruffles its feathers and stretches. It is then that it notices the human making his way along the rim of the ravine in the distance. It lets out a shrill cry and launches itself into flight in the direction of the uninvited visitor. I’m in Gyr Falcon country. Gyr Falcons defend their territories with great vigour. They are powerful birds, the largest of all falcons, and yet display tremendous agility in flight. They are supreme hunters and can reach amazing speeds as they stoop from a great height to seize prey in their talons. As with other raptors, the female is noticeably larger than the male and is the dominant partner in the relationship. Gyr Falcons mate for life but if one party dies it is soon replaced by another bird. 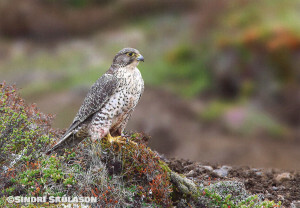 Unlike its small relative the Merlin, the Gyr Falcon is resident in Iceland all year round. It breeds in cliffs, ravines or canyons and nests are often found in inaccessible locations. The nest itself is not a very complex structure at all, and in fact it’s hard to talk of nest-building in Gyr Falcons. They readily take over any old Raven’s nests located in their territory; otherwise they nest in small caves or on vegetated ledges. Territories typically contain several nest sites although the number varies. Some pairs use the same nest year after year while others move around and do not use the same nest in consecutive years. Courtship begins in March when the female stops hunting and remains on the territory. The male then begins to bring her prey until it is time for breeding, which is usually at the beginning of April but it does depend to some extent on weather conditions. She lays from two to five eggs, but normally three to four. The eggs take five weeks to hatch and the female stays with the chicks until they are two to three weeks old. In the meantime she is totally reliant on the male to hunt. At the end of this period both male and female birds hunt as the chicks grow fast and have enormous appetites. The young tend to leave their parents in August and disperse. They reach sexual maturity between the ages of two to four years. The Rock Ptarmigan is the main prey of the Gyr Falcon and the link between these two species is so strong that if the Rock Ptarmigan population declines, numbers of Gyr Falcons subsequently drop, usually two to four years later. A wide range of waders, wildfowl and seabirds also feature on the menu of the Gyr Falcon, but Rock Ptarmigan will always be the prey of choice if available. The Gyr Falcon has always been close to the top of the list of birds I have wanted to photograph. As is the case with the White-tailed Eagle, Snowy Owl and Red Phalarope, the Gyr Falcon is strictly protected and it is forbidden to approach a Gyr Falcon’s nest without permission from the authorities. 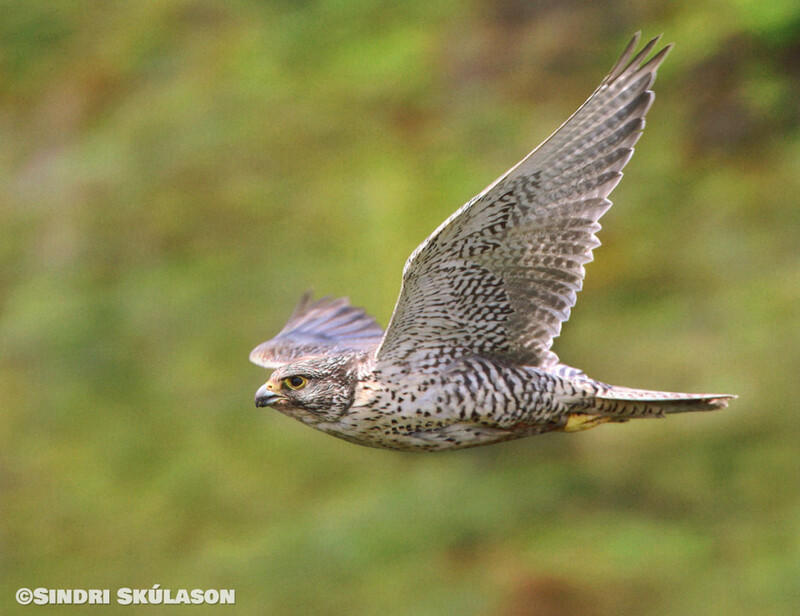 Gyr Falcons are scarce and their protected status is designed to allow the population to grow. Provided they have got permission in the first place, bird photographers must always make the welfare of their subject the first priority and show common sense when taking photos. If due care is not taken when approaching a nest, the young may fall out if the female is startled and suddenly takes flight, or young which have not quite fledged may put themselves in danger if they become frightened and try to flee. It is therefore vital to keep a reasonable distance and ensure that the birds are disturbed as little as possible. It is a good idea to get to know your subject before you embark on your journey. After I had obtained the necessary permission, the first thing I did was to read everything I could get my hands on about the life and behaviour of Gyr Falcons. I was also fortunate enough to be able to get sound advice and information from Ólafur Karl Nielsen, who has an encyclopedic knowledge of Gyr Falcons. Although I had the required permission, actually getting to photograph the birds wasn’t straightforward. The difficulties of finding a nest suitable for photography and poor weather conspired to make it a tricky task. The summer of 2011 was late to arrive and the unpleasant weather meant that many pairs failed to breed. There are many things to keep in mind when photographing Gyr Falcons at the nest. Firstly, you need to find a nest which you can photograph from a distance that causes the minimum disturbance to the birds. If your presence disturbs the normal behaviour of the birds, you have to be prepared to pack up and move elsewhere. It is therefore vital to understand how best to approach the birds and what methods best suit the subject. The goal of the photographer should always be to blend into the environment and get shots of the subject going about its daily routine as if the photographer were not there. The difficulty of doing this in practice varies from species to species and sometimes accessories are needed. When photographing Gyr Falcons it is best to use a portable hide or at least have a blind, for example on the opposite side of the ravine so you can follow the comings and goings of the parents and young without their noticing you. This kind of photography often requires a great deal of patience as much of the time is spent waiting. But you soon forget the waiting around when the moment you have long dreamed about plays out in front of your lens. Another important consideration is not to attract the attention of others to the location of the nest. The first nest I found (with others) was too close to a road to photograph safely so I decided to leave it alone. This can be a difficult decision at times, especially when it is proving difficult to find a suitable nest, but the welfare of the birds must always come first. You must also never reveal the location of a Gyr Falcon nest. Unfortunately, there are still too many people who ignore the ban on approaching Gyr Falcons in the breeding season and thereby place this scarce bird in danger. Sadly too many Gyr Falcons are shot and egg collectors covet Gyr Falcon eggs although this activity seems to be less common today. Spending time near a Gyr Falcon’s nest and having the opportunity to watch these magnificent raptors in action is a truly unforgettable experience. I believe that it’s good for mind and body to spend as much time as possible out in the Icelandic countryside, far from the hustle and bustle of the city. Bird photography is an excellent way to connect with the environment and to learn to appreciate the beauty of our surroundings, both the small things and the larger things. One of the things I try to do through photography is to share the wonders of what I have seen with other people. A photograph shows just one moment frozen in the sea of time, but for the photographer it is often the fruit of a long process which crystallizes in this one instant to commemorate the experience. If we can share just a small part of the experience through a photograph, the objective has been achieved. Hopefully we can also contribute by making people aware of the importance of protecting the diversity of Iceland’s birds.